Comprehensive information about Jyoti Prasad Agarwala including biographical information, facts, literary works, and more. Jyoti Prasad Agarwala (Assamese : ; 1903 - 1951) was a noted Assamese playwright, songwriter, poet, writer and film maker from Assam. He was considered as Assamese cultural icon, deeply revered for his creative vision and output and is popularly called the Rupkonwar of Assamese culture. [ citation needed ] In fact, he is regarded as the founder of Assamese cinema for Joymati (1935). His death anniversary (January 17) is celebrated as Silpi divas (Artists' Day) in his honor. This educational Jyoti Prasad Agarwala resource has information about the author's life, works, quotations, articles and essays, and more. 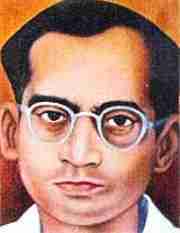 Articles about Jyoti Prasad Agarwala or articles that mention Jyoti Prasad Agarwala. Here are a few random quotes by Jyoti Prasad Agarwala.